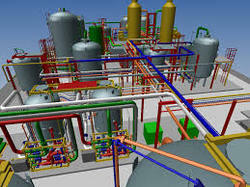 Providing you the best range of equipment layout in chennai, equipment piping layout, piping design, kodabakkam piping design company, piping design company and design company in chennai with effective & timely delivery. 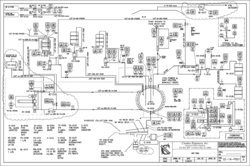 When Process flow sheets and major equipment dimensions (e.g. Equipment list) are available. Piping Engineer should first develop a one-plane elevation of all Equipment to scale and relatively locate to fulfill process requirements. He should keep good Margins for nozzle lengths, bends, valves, slopes and distances between equipment, etc. While locating the equipment. He must as well think of structural/concrete beam depths, Monorails, pipe-ways, cable trays, lighting, etc. while deciding the floor elevation. This one-plane elevation view should be discussed internally and then with PE group who will Check relative locations & elevations of equipment. 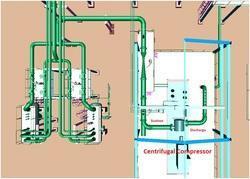 Routing of major & critical process lines Should also be discussed at this stage. 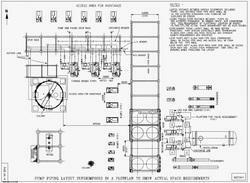 After deciding floor elevations and number of floors, Work can start on preliminary arrangement drawings which should show each floor plan as Well as elevation views at different sections. 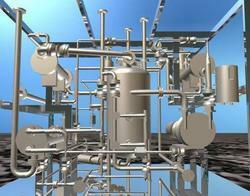 Piping specialty items is an inline piping component that is not pre-defined within the existing piping specification. Components made to standards that are not listed within the code, or are not covered by a standard, may be used within the piping system provided they meet requirements set out in the code, such as testing. These are unlisted or specialty items. 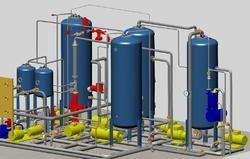 · Preparation of Material Requisition. These include Strainers, Steam Traps, Restriction Orifice, Orifice Flanges, Silencer, Utility Hose Reels, 5D Radius Bends, Scale/Corrosion/Biological Probes & Retrieval Tools Kit, Pig Detector, Hinged Closures, Spray Nozzles, Fire and Foam Hose Reels, Continuous Drainers, Hoses & Hose Connection, Flame Arrestors, etc. 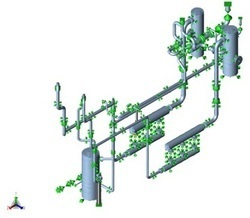 Perform Static Analysis of Critical Piping System connected to Pressure Vessels, Heat Exchangers, Drums and Filters. 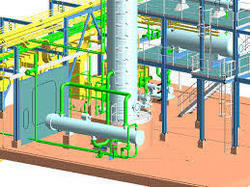 Visual Clearance of Non-Critical Piping System. Preparation of Stress Analysis Design Basis. Preparation of Critical Line List. 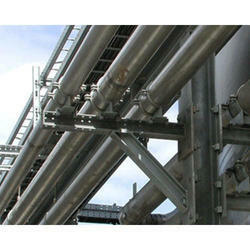 Engineering Support of piping design – Pipe hangers and supports. Low temperature brittle fracture assessment. Flow-induced and acoustic vibration evaluation. 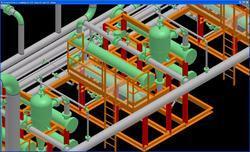 Piping isometrics are three-dimensional representation of the line. 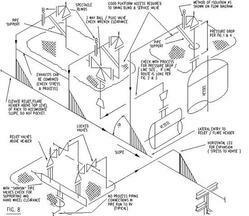 The main purpose of an isometric is to provide all information necessary for the fabrication and erection along with the bill of material required to do so. 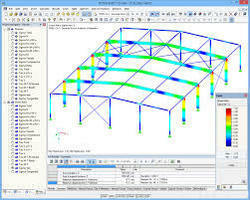 Isometric is also used to work out the exact MTO requirement. · Preparation of preliminary & detailed GADs, BOMs/ MTOs etc. Our As-built documentation and engineering service ensures comprehensive and accurate final documentation for an as-built plant. Our experienced team of engineers is knowledgeable in a variety of commercial document management systems such as PDS, ProArc, etc., and conducts site surveys which involve taking necessary measurements, documenting markups, updating 3D models etc., based upon the client request. 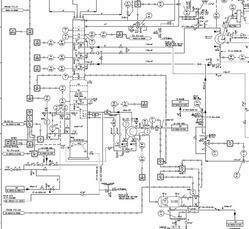 We are an unparalleled name in offering Piping And Instrumentation Diagram Services which represent the interconnection of process equipment and the instrumentation. 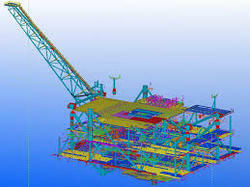 The offered services are executed in a prompt manner by our skilled professionals who conduct an on site evaluation of facility and take notes and measurements to create the diagram. 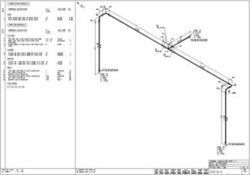 Our offered services are broadly appreciated for their simple drawings which are easy to understand by all disciplines, engineers and installers. While rendering these services, we lay special importance of our clients' contentment. Besides this, we provide these services to our clients at affordable prices. 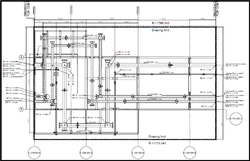 · Preparation of data sheets and requisition for spring hangers, expansion joints, snubbers, slide plates, etc. We offer excellent professional support in Designing and Manufacturing of Special Purpose Machines for production, Material Handling tools required for high production rates with consistent quality. We take the specification and requirements from our clients and start from initial design study and concept through to full scale special purpose machine design and build. We do this by employing advanced design techniques, software and principles. 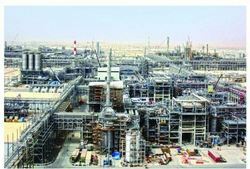 Process Plant Consultants (PPC) is a flourishing Engineering Consultancy Company established in the year 2000 providing engineering services in the field of Pulp and Paper, Hydrocarbons and Petrochemicals. With many years of experience, PPC manages with skill and precision all aspects of front end engineering design and its hallmark is perfect delivery within the stipulated period. 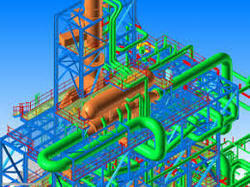 PPC’s expertise is engineering projects in Pulp and Paper, Detailing of Utility Engineering for many five star hotels in Chennai, India, Design of Static Equipment which complies with International codes, Stress Analysis of steam pipes and hot pipes connecting stacked heat exchangers and many other related areas. Stress–strain analysis (or stress analysis) is an Engineering discipline that uses many methods to determine the stresses and strains in materials and structures subjected to forces. In continuum mechanics, stress is a physical quantity that expresses the internal forces that neighboring particles of a continuous material exert on each other, while strain is the measure of the deformation of the material. “AVEVA PDMS is the most widely used and comprehensive 3D engineering design solution in Sweden,” said Anders Svensson, Conmore. 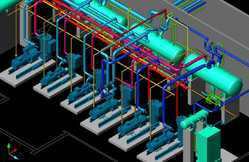 “This was very important in our selection, not least because we have immediate access to a highly skilled pool of design engineers with experience in PDMS. This availability to experienced talent will assist our recruitment as we push into more markets. 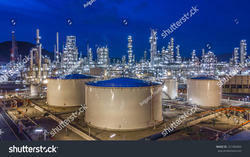 We are developing new projects in the process and energy industries and with AVEVA’s technology expertise it is the obvious choice as our software partner”. 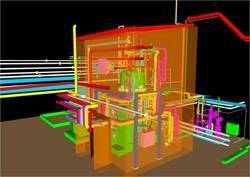 Looking for piping design ?